The Residents aren’t of this planet. Maybe not even of this universe. Maybe they don’t exist. It’s entirely plausible that they are nothing more than ghosts, existing in either the semantic or the spiritual realm. 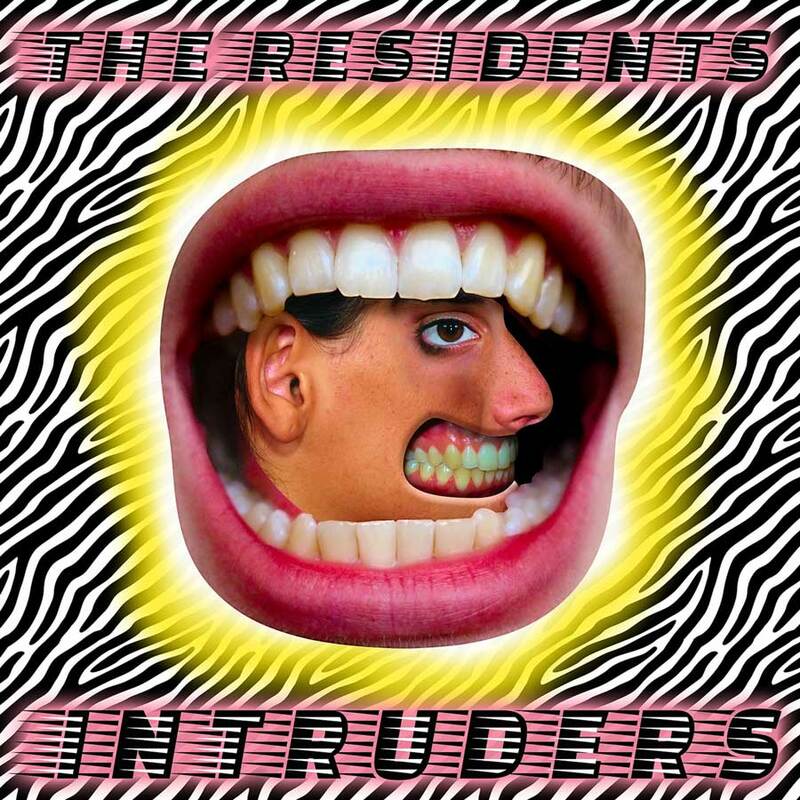 There’s empirical evidence that something called ‘The Residents’ exist: a website, a Facebook page, a Twitter feed, a YouTube page, 40+ studio albums, 20+ live albums, 35+ singles and EPs, a bunch of multimedia projects, and an abundance of appearances on stages around the world. There’s evidence everywhere. Well, not everywhere but there’s lots of it. And if there’s stuff out there in the physical realm – in this case lots of it – that points to the existence of a creator then surely, said creator must exist. Y’know, like God does. Last year, The Residents decorated seven tall tales of train wrecks in their customarily colourful sonic shades and shapes for the simultaneously entertaining and disturbing album that was The Ghost of Hope (reviewed here). This year, the possibly extant band returns to us with Intruders, an album that focuses on “the metaphysical realm of imaginary beings”. So yeah, it’s time to take up the band’s invitation to inspect the corners of our consciousness to find those unseen and the uncontrollable beings that lurk therein. The unsettling and ghostly ‘Bobbie’s Burning Blues’ tells the chilling tale of Roberta slowly disappearing inside her own pantsuit from her own family and work life. ‘Voodoo Doll’ tells of a troubled man walking down the street only to be hit in the chest with a voodoo doll of himself, pins protruding from limbs, torso and face. The most distressing aspect? The exquisitely stitched tweed jacket exactly like the one he wore long ago of course. Think that’s weird? How about this one: driving along a road near a corn field, a middle-aged black man sees ‘The Scarecrow’ clad in a blue and green plaid bathrobe. And what does it look like? An effigy of James Brown of course. That this happened just days after the Godfather of Soul’s death is mere coincidence. Isn’t it? ‘…my spirit is a shallow sack of human waste’, by the time ‘Frank’s Lament’, track four, comes around, reality and all that is taken as certainty is now certainly in question. Fingers clicking like that sole jazzo feeling the groove in that smoke-filled club, ‘Missing Me’ lures us further out into the hinterlands where ‘Still Needy’ finds a voice asking, ‘Please, oh please, can I help you?’ Who, or indeed what, it is that’s doing the asking is unclear. Murky even, much like the place into which we have somehow been enticed. ‘The Other’ offers no respite, nor does it offer any answers. ‘twas foolish of me to expect, or even hope, for it to do so I must concede. Surely a track with the title ‘Good Vibes’ can’t be anywhere near as disconcerting or disturbing. Can it? Yes it can. Of course it can. Why would a tale of a doppelganger staring back at a man in the window for hours on end be anything but ominous? Three tracks remain. And with ‘Endless And Deep’, ‘Running Away’, and closer ‘Shadows’, the final nail in the coffin of certainty is hammered home. Surrounded by ghosts that seem to have a more concrete existence than the one experiencing them, neither the past nor a baseball game offer an escape from the darkness, the light, the eeriness of night, the ether or the stale ‘n sorry echoes of a hug. And nor do they alleviate the loneliness that being followed by so many possibly-but-maybe-not-but-they-surely-must beings brings.